CLICK HERE TO PRINT COUPONS! Coin-up Laundromat, Dry Cleaning, Laundry service in our one stop location on Rt. 1 in Hampton minutes from downtown. We just need your credit card number, contact number and address for service. There's no paper to fill out! · Wedding Gown Cleaning, Preservation and Restoration. · Fire / Smoke / Flood / Water Damage Clothes cleaning. · Clean and Press laundry shirts service with our "State of the Art" Equipment. At Hampton Cleaners we want to ensure that your dry cleaning, tailoring, and laundry is done professionally, which is why all of the work is done on our premises. We make sure it’s done right by our professional staff and State of the Art equipment to get your clothes back to you in their best condition. Life happens. Whether you’re busy at work or your kids are in the middle of their sports season you may notice a pile of clothes that you just haven’t had a chance to get to. Maybe you’d just like the added convenience of not having to go to the Laundromat or Dry Cleaners. 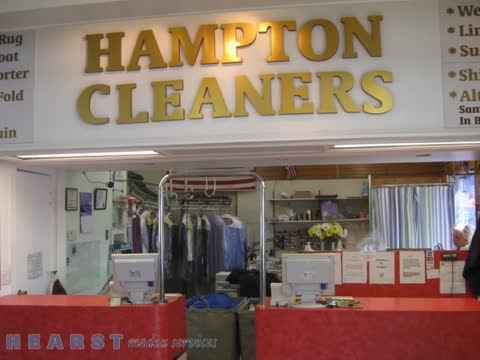 Hampton Cleaners is here for those times. Our Pick-up and Delivery Service is convenient and easy to set up. All we need is a credit card, a phone number, and your address and you’ll be on your way to cleaner laundry. We also offer additional specialty services for wedding gowns, water or fire damaged clothing, rug cleaning, linen service, curtain and drapery cleaning, fur cleaning, wash and fold service. Make sure you call Hampton Cleaners to make it easy and make it clean. Expert tailoring service of Wedding and Prom gowns and everyday clothes. Alteration fitting is available at Hampton location Monday thru Friday: 6:30 to 4:00, Saturday: Calling for appointment is recommended.